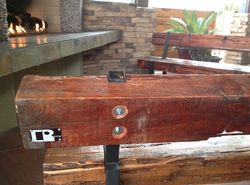 This bench measures 10 ft long, and has 3 square steel frames supporting the 2 large Cedar beams. The coating is a satin urethane finish. 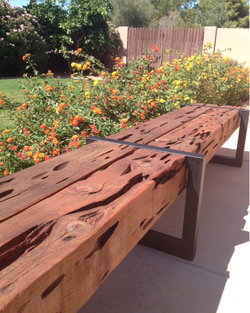 This bench measures 75" long with 2 custom steel frames holding up the 3 solid beams of wood. It has a semi-glossy urethane finish on the wood, and a rusted finish on the steel. This bench is 8 ft long and was left unfinished. 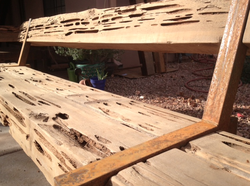 The wood will eventually turn to a grey color if left in the elements. The steel was rusted and left unfinished for a real natural look. 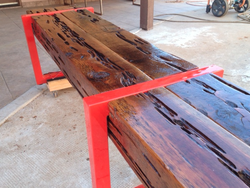 These benches are 8ft long and are coated with a glossy urethane. The steel is rusted and coated with a clear enamel. Multiple unit discounts are available. This bench is 10ft long, and the 3 steel frames were powder coated in red. Powder coating is available on all benches. Flat black is in stock, and custom colors are available. 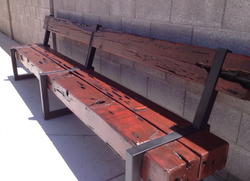 This bench is 10ft long and was stained with a gunstock red color and black to give it some depth and more character. 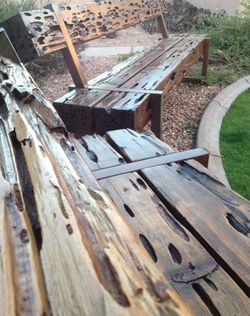 Check out the benches at The Lodge at Tucson's Foothill's mall. 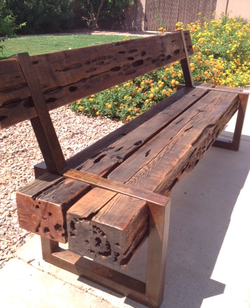 These 4 benches were completed and delivered in 1 week from ordering. Your company logo or name can be put onto the bench.